Since 1979, the Apex Lions' Relays has been one of the first stops for many athletes on their way to end-of-season greatness. "The week of the Apex Lions' Relays was when the race to the state championships began," said hall-of-fame and former Raleigh News and Observer high school sports reporter Tim Stevens via email. This Saturday at Green Level High School in Apex, track and field athletes from throughout North Carolina will flock to the venerable April meet as they have for 40 years. It's certainly a unique event, showcasing relay events that typically aren't contended at most normal track meets, as well as field events and a handful of premier individual running events. For the second year Apex Lions' Relays will be run at Apex High's current home of Green Level High School. Next year Apex and the Apex Lions' Relays will move back to it's permanent home of the newly rebuilt Apex High School. Many notable performances have been achieved at the meet over the years. Winners of the meet have included a world championship participant (Clayton's Johnny Dutch in a meet record 13.74 for the 110m hurdles in 2006), the child of an Olympian (Pinecrest's Carmen Alder in 4:56.47 for the 1600m in 2018), and a U.S. National Champion (Reagan's Craig Engels in 4:11.87 for the 1600m in 2012). Even former NFL defensive end Julius Peppers and basketball legend Michael Jordan have competed at the storied event. For many other racers, the Apex Relays has been an important chance to test themselves against the state's best. 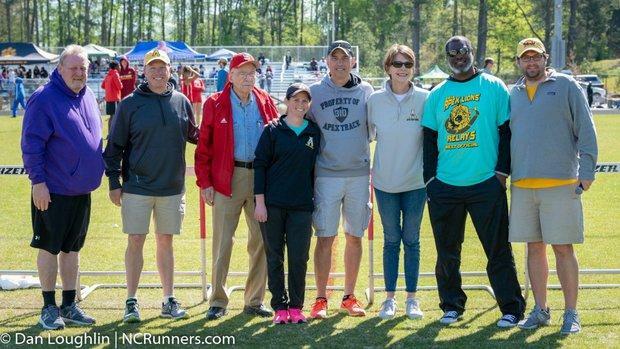 "The meet I think helped [athletes] understand that they could compete at a bigger level, and maybe become the stepping off point to state championships, and going to New Balance Nationals, and then running on in college," said Apex Lions' Relays meet director and Apex High School track and field coach Roy Cooper. Ed Tindal, coach of the Apex track and field team at that point, recognized the need for more high-profile track meets. So Tindal took action. "He was looking to fill a void," said Cooper. Instead of waiting for someone else to create new invitationals, he designed his own to be held at the Apex track. Tindal constructed not just any meet, but a rare relays meet, hoping to attract athletes looking for a combination of both competition and enjoyment. "It was just designed to give kids a little bit of a different flavor at that point in the season," said Cooper. Tindal formed a distinctive slate of events: all the regularly contested relay events (4x100m, 4x200m, 4x400m, and 4x800m), along with the 4x1600m, distance medley relay (DMR), sprint medley relay (SMR), field events, and some elite individual running events. Currently, the individual races contested at the meet consist of the 100/110m hurdles, 1600m, and 100m. Tindal laid out all of the logistics and details. But then came the question of how the meet was actually going to come to fruition; the event certainly needed to employ the work of a herd of volunteers, so where would Tindal find enough people to organize, finance, and host it? It just so happened that the Apex Lions Club, a local division of an international service organization, was looking for a new charitable project to become involved in. With deeply rooted ties to Apex High School dating back to 1939, the club and the Apex track program joined forces to organize the event and serve the community. "The club decided that since they did have a strong relationship with the track team, they would get involved with establishing this annual track event," said Horace Johnson, Membership Chair of the Apex Lions Club. All the meet needed then was a name. From the partnership came the simple name that would come to stick: Apex Lions' Relays. The first Apex Relays wasn't necessarily a huge meet. According to records Cooper has analyzed, somewhere around 15 to 20 teams probably competed in the inaugural event. Schools represented at the meet came mostly from eastern North Carolina, from the coast up to the central region. And the Apex Lions Club helped with every step along the way. The group spent countless hours handling the tedious tasks, from the meet registration and entry fees to the concessions and meet expenses. Costs were covered by the club, and profits made from the Apex Relays went straight back to the Apex track and field program. The Apex Lions Club continues to remain the most significant partner involved with the meet. "This event is one of our key local activities that we support each year," said Johnson. Steadily, the meet grew. Cooper took over as meet director in 1985 while serving as Apex's athletic director, and he's helped attract more teams and more competition ever since. Now, Cooper finds himself having to turn away interested teams, trying to keep a cap at around 50 schools to prevent from creating a long, drawn-out meet. The state's top athletes also caught wind of the building hype surrounding the Apex Relays, so they traveled to the Raleigh suburb to put their abilities to the test. As the number of competing teams rose, the volume of participating elite athletes skyrocketed. [North Carolina's best athletes] all met there and we all got to race each other for the first time every year," said Blake Williams, current Green Hope boys distance coach. Williams was one of the many esteemed athletes who toed the start line in Apex during his high school career. The Northern Durham alum put down one of the most impressive times ever recorded in the meet's history back in 2010-4:11.43 for a meet record in the boys 1600m that still stands today. As evident by Williams' performance, North Carolina athletes redefined what were considered to be stellar marks and times in high school track and field as the years passed. Athletes improved their times to compare with the likes of nationally-known talent. Cooper believes this transition contributed greatly to the production of many jaw-dropping races and performances at the Apex Relays. "The kids in the state have really stepped up their abilities and their training, and you just have a whole lot better performance [at Apex Relays] than you used to," said Cooper. Apex Lions' Relays became one of the most talked-about events around the state. Athletes, including Williams, couldn't wait for April to roll around to finally get their chance to face the tough competition in Apex. "Apex Relays was the best. It was one of the most fun meets," said Williams. The Apex Lions' Relays have produced many impressive times and marks throughout its history. One that stands out in Cooper's mind is Johnny Dutch's mind-boggling race in the boys 110m hurdles back in 2006. Representing Clayton, Dutch ran a time of 13.74 (converted from hand time), a time he would go on to improve upon later that outdoor season when he won the event at Nike Outdoor Nationals. Then there's the Frazier sisters. Both Ryen and Wesley Frazier of Ravenscroft combined have posted five of the top 25 times ever recorded at the event in the girls 1600m, with Ryen holding the meet record of 4:43.22 set back in 2015. Historically, 21 girls have dipped under five minutes in the event at Apex Relays, and the Frazier sisters and former Leesville Road star Nevada Mareno are the only ones who have ever gone under 4:50. And then just last year, Veronica Fraley of Wakefield smashed her own previous meet records in the shot put and discus, putting up marks of 46-10 and 165-7. This year, athletes will continue to strive for impressive marks. Notable athletes in the premier running events Cardinal Gibbons' Taylor McKinnon, who will look to improve on her NC#1 time in the 100m hurdles and chase after the meet record. Garner's sibling duo of Randolph and Jonah Ross will take on the 100m, with Jonah hoping to defend her title in the event from last year. On the field, Morgan Smalls of Panther Creek will look to sweep the long jump and triple jump titles, and setting new meet records in both won't be out of the question. In the relays, Cary could be poised to set a new meet record and improve on their own North Carolina state record in the boys 4x1600m. The star-studded Southeast Raleigh sprint team will also look to dominate, fielding both boys and girls relay teams in the 4x100m, 4x200m, 4x400m, and SMR. Other teams that could make an impression include Broughton in the boys 4x800m, Chapel Hill in the girls 4x1600m and 4x800m, and Cardinal Gibbons in the girls DMR. If you're an athlete wondering whether or not you're a regional-caliber performer, you'll find out at Apex. If you're an athlete doubting whether you can compete with the best at the state championships, you'll find out at Apex. And if you're pondering whether you have a chance to win a state title, you'll find out at Apex. "It was one of the biggest meets, if not the biggest in North Carolina outside of states," said Williams. Cooper has now served as the dedicated Apex Lions' Relays meet director for 35 years. To him, the relays are more than just your average track meet. "It means something to me," said Cooper. He remembers spending late nights leading up to the event laying on the floor, surrounded by entry forms as he seeded each race by hand. He still spends hours of his time designing t-shirts, ordering awards, and organizing custodial care for the meet. Cooper has always been committed to truly hosting an impressive event for all to enjoy, a principle he said he most likely learned from his father. "My obligation and responsibility on Saturday is to make the meet go," said Cooper. Cooper influences the Apex track and field program to become just as involved in the process as he is. With a team of upwards of 150 athletes, there's an expectation that if you run at Apex, you dedicate some of your time and effort towards the meet to make it truly meaningful. "The idea is that our school, our community, our program hosts this event. It's supposed to mean something," said Cooper. The Apex Lions Club strives to create this meaning by bringing the community aspect into the relays, hoping to show the town of Apex how much they care. Acting as the key sponsor of the meet is something Johnson believes connects back to the club's simple yet profound motto: "we serve." "We just have a strong tie back to the Apex community, so this is one of the events that is a highlight every year," said Johnson. "It's something we want to do." Even the competition level of the meet gives athletes and spectators strong admiration for the pure athleticism and talent others possess. As Cooper put it, a girl who just broke a six minute mile can learn to have a greater appreciation for the girl who breaks five minutes by witnessing it happen at Apex Relays. "I think it has a positive impact there," said Cooper. And this year's meet will be no different. It will mark a 40th anniversary, yet the meet will continue to highlight impressive races and performances like business as usual. Sure, Cooper acknowledges that not everyone in the Apex community will come out to Apex High School to watch high school students race around a track and compete in field events. But, the Apex Relays have a significant impact on kids looking for new opportunities and new growth. "The Apex Lions' Relay was a groundbreaking spring track meet," said Stevens. Go to any high school track and field meet in North Carolina, and you're likely to see at least one athlete fashioning one of the classic, coveted Apex Lions' Relays meet shirts. It's typically not too hard to spot them, with the words "Apex Lions' Relays" plastering the fronts in bold lettering, often paired with silhouette figures of runners, jumpers, and hurdlers. "You see the t-shirts everywhere," said Cooper. Athletes will rush to the concession stands on Saturday to grab the memorable meet shirts. This year's shirts will even feature a unique design recognizing the landmark event, listing the years "1979-2019," with a tornado replacing the dash to represent the one year the meet was cancelled due to poor weather. But the name on the front alone represents an iconic and recognizable part of North Carolina track and field history. "Having the meet go off well and having coaches and parents and athletes say how much they appreciated the opportunity to run, that makes me feel good," said Cooper.